We love designing our son's nursery so much that we were excited to have the opportunity to create a dreamy woodland nursery for our little nephew. 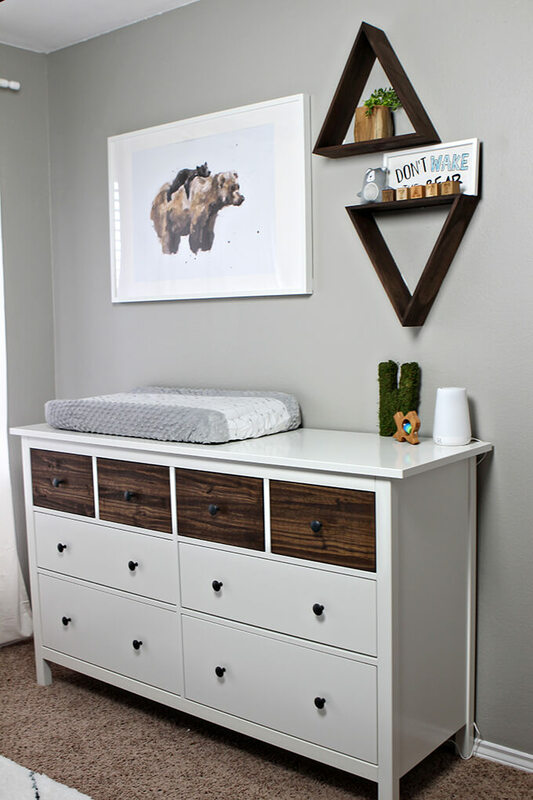 The parents to be wanted a bear themed nursery with white and wood tones and bear accents. For the focal wall in the room we painted a floor to ceiling whimsical woodland wall mural with subtle blue tones. Brent also painted a water color painting of a mama bear and her cub just for his sister to hang over the dresser. We made the simple wood bear mobile for an extra special touch. The best part of the weekend room makeover was seeing Brent's sister and her husband's reaction to the surprise room reveal. Their sweet reaction and a video of the room design coming together can be seen on our blog: http://www.grayhousestudio.com/woodland-themed-nursery-room-reveal/. and documenting them over at // www.grayhousestudio.com.